Did you know that it’s estimated around 4% of the United States population choose to have a vegetarian diet, and a whopping 38% of all Indians only eat plant-based foods? Many restaurants around the world have picked up on the growing demand for veg-friendly food, as have the very best Maldives resorts. One of our favorite resorts in the Maldives now has its own vegetarian restaurant that serves up some incredible gourmet delights made from locally-grown organic produce. Read on for four tips that will help you to enjoy a meat-free culinary adventure to the Maldives. Unsurprisingly, the most important thing when it comes to having a wonderful Maldives vacation (with food that caters for your vegetarian diet), is to choose your Maldives resort wisely. Once the Maldives weren’t particularly vegetarian-friendly destination: plant-based foodies were left with a limited food selection that often centered around the salad bar and fruit platters. But luckily, nowadays the top Maldives resorts have upped their game to create a range of plant-based dishes that would satisfy even the most meat-loving of guests. Topping the list is Atmosphere Kanifushi, as it’s home the first ever vegetarian restaurant in the Maldives. The delectable menu features unique blend of European cuisine with a Middle Eastern and Maldivian twist. If you’re lucky enough to stay on this luxury resort island, you really must try the authentic fettuccine with almond pesto (which is suitable for vegans), as well as the incredible paneer butter masala that is something to write home about. The desserts are also spectacular. If you have room after feasting on the mains, then try the mascarpone tiramisu and the sticky carrot halva. A huge selection of vegan drinks are on offer here too, something which is lacking on some of the other mega resorts. We love how Atmosphere Kanifushi are also able to cater for those on a Jain and raw food diet, as well as for guests who choose to eat gluten-free too. An extra bonus here is the all-inclusive package, which includes all meals at the vegetarian restaurant as well as all drinks and snacks during your stay. Click here to get the best deal at Atmosphere Kanifushi. A true piece of paradise, Ayada Maldives wows with it wonderful vegetarian friendly-menus, as well as its stunning stilted water villas. The staff here have created an interactive dining experience to provide vegetarians with a wonderful range of options. A lovely touch is the fresh salad bar, where you can actually pick out your own vegetables and the chefs will slice them up right in front of you to make your own personalized salad. For a satisfying lunch, try the homemade vegan burger which comes with all the trimmings you need for a hearty meal. And you’ll never be left out at a fancy dinner on the beach, as Ocean Breeze Restaurant is the place to go for a fine dining experience for two. Here you can enjoy delights such as a lentil salad with parsnip, pineapple and lemon dressing, or a grilled eggplant with dreamy melted mozzarella. For something different, head over to the Japanese teriyaki grill for some veggie friendly sushi, miso soup, and mochi. Coffee-lovers are well catered for, particularly at the Turkish bar where you can sip on a super strong yet tiny cup of Arabic coffee in the Ottoman Lounge. The restaurants are stocked with a selection of plant-based milks for your smoothies, teas and coffees. Unlike the Kanifushi Resort, Ayada Maldives doesn’t actually offer an all-inclusive package, so you will have to buy your meals individually. However, there is a romantic package which can be added on to your accommodation. 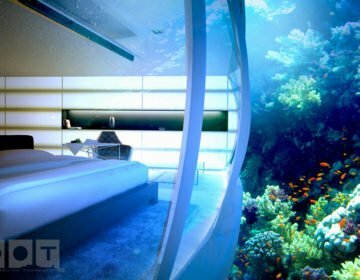 This package includes treatments, a dolphin snorkeling tour, a rose petal decorated bed for you when you arrive, a shisha experience as well as a bicycle rental for two. Click here to see more photos, and book your stay at Ayada Maldives. Another heaven for veggie foodies is the Soneva Fushi. This beautiful resort has the laid-back luxury vibe down to a T, and they care very much about creating an eco-conscious environment. Many of the buildings are open-air to allow in a cool breeze, and are constructed completely out of locally sourced materials. There’s also an extensive recycling program including a glass studio where you can watch artists transform glass bottles into works of art. But let’s get to the wonderful food. For those with a sweet tooth, the absolute highlight has to be the chocolate room and ice cream parlour. Straight out of Willy Wonka’s factory, these rooms are home to all sorts of chocolates, ice cream and toppings. And don’t worry if you don’t do dairy – many of the offerings here are vegan-friendly. For a memorable lunch, climb up the walkway to the treetop restaurant called Fresh in the Garden. Here you can dine way up in a nest, surrounded by swaying palms. 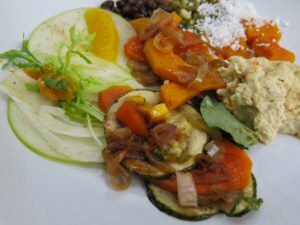 All of the food is is organic and grown in the nearby garden, and dishes are particularly creative with their flavors and presentation. Guests rave about the almond resin dish which has crumbled almond nut cheese topped with raisins and pistachios. And there’s more delights for vegans too. The Japanese restaurant, called ‘By The Beach’ has a vegan tasting menu and some of the best coconut ice cream around. If you’re travelling with your little ones in tow, then Soneva Fushi is the most family-friendly out of the three resorts we’ve chosen here. The resort has a specially designed area called the Den which features its own kids pool, games room, Lego room and dressing up room. Soneva Fushi offers an all-inclusive package which includes all meals and drinks as well as return shared transfers. Click here to score the latest deals on Soneva Fushi. Before you leave on your Maldives adventure, be sure to drop your Maldives resort an email to let them know your exact dietary requirements. A great Maldives resort will put this information on file and make sure that they go all out to ensure that you are properly catered for. You can also do this when you arrive by just checking with the concierge to let them know your preferences. 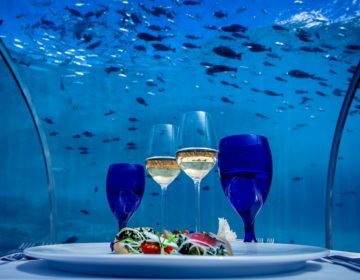 They will be able to give you some extra tips on what you can and can’t eat when you are dining at your Maldives resort. They will often create special dishes for guests, or put on a whole the vegetarian tasting menu for a romantic evening for two plant-based lovers. Finding vegan and vegetarian food when you are in the Maldives is one thing, but having it during your journey is another. At least 48 hours before you depart on your flight, make sure that you check with your airline that you’ve actually ordered a vegetarian or vegan meal. Quite often these can get mixed up, so it’s always worth double-checking so you’re not left hungry on the flight. Almost all major airports now offer a good selection of vegetarian options, however it goes without saying that you should bring along a few of your favourite snacks. Think dried nuts and fruit, kale chips, and protein balls. These types of snacks travel well, and if you have some leftover after the journey you can always pop them in your minibar and enjoy them once you’re at your Maldives resort. Seaplanes only able to depart during daylight hours, so you may actually find yourself having to spend the night on the main island of Huhule. Or, you may also want at a glimpse of the traditional Maldivian culture which can be lacking on many of the Maldives resort islands, and choose to go and visit one of the smaller island where the friendly locals live. 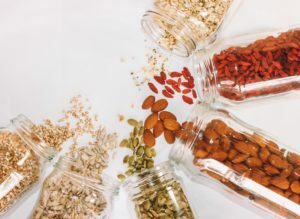 If this is the case, then finding plant-based foods maybe a little trickier, but it’s certainly not impossible providing that you know where to look. If you need a place to stay then we can highly recommend the Hulhule Island hotel, which has everything you need for a comfortable and convenient stay. There’s also the Sala boutique hotel, which is located in the heart of the Maldives and within easy reach of the prime shopping and dining areas. They have a wonderful authentic Thai restaurant, and the lovely chef that are you able to adapt the menu for vegan and vegetarian diners. Try the delicious pad thai, or the massaman curry is a favourite too. You can also head to Pizza Mia and ask for a pizza without any cheese if you are vegan. Some of the Italian restaurants in town serve up veg-friendly food such as pomodoro pastas, bruschetta and generous ensaladas. When it comes to dining on one of the smaller local Islands such as Rasdhoo and Thoddo, you may have to do a little detective work in order to find the best place to eat some plant-based food. Much of the food here is highly spiced, coconut-based with Indian influences, however dishes can often contain a lot of freshly-caught fish. You may be able to scout out small local restaurants where you can view the food that is on offer in a kind of cafeteria style selection. If this is the case, you should be able to pick out the veggie-friendly options, such as vegetable fried rice, freshly baked naan breads, stir-fried vegetables, samosas, and daal. You will often find street sellers offering a selection of exotic fruits that include mangoes and pineapple, which are great to snack on throughout the day. Fresh coconuts can also be found everywhere here, and they’re great to help keep your electrolyte and hydration levels up in the Maldivian heat. 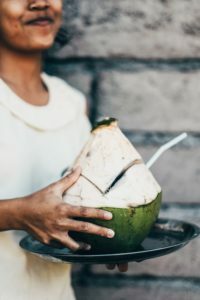 If you get your hands on a young coconut, then you can ask the vendor to chop it open after you’ve drank the coconut water, and then scoop out the coconut flesh for an extra treat. 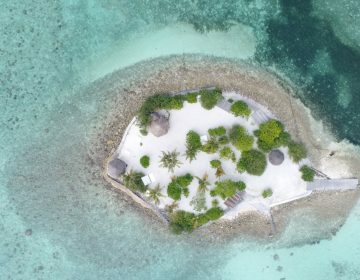 If you plan on spending a longer time on one of the local Islands, then it may be worth choosing Maldives accommodation which has either a private kitchen or a shared kitchen space which you have access to. This way you can head to a local store and pick up staples and fresh fruit and veg, in order to prep your own veggie meals yourself. Consider these four points before booking your trip to the Maldives and you will be sure to have a successful trip filled full of delicious dishes. 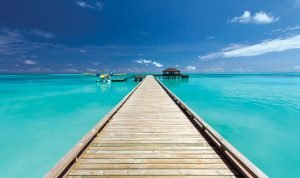 If you need a little extra help booking a Maldives trip then check out this article to find the best time to go to the Maldives, and read this for everything you need to know before you go. Enjoy!